10. 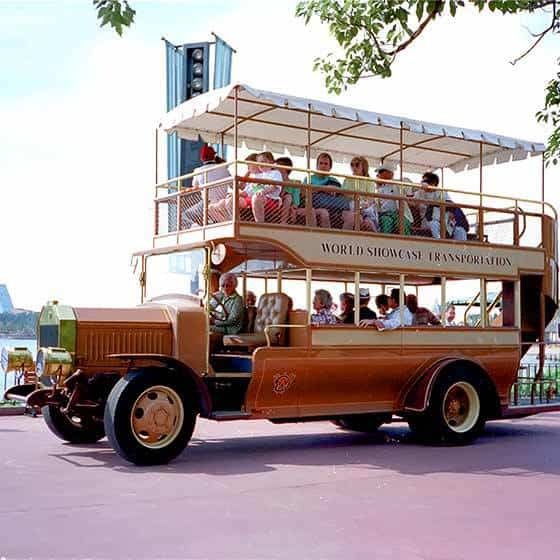 A double-decker bus used to transport Guests around the World Showcase. There was a time at EPCOT during which a fleet of old-fashioned open-air double-decker buses made their way along the World Showcase Promenade. There were scheduled stops along the Promenade, but you could also ride one of the buses all around the World Showcase Lagoon. Because the Promenade usually stays bustling with traffic, you can be sure that those buses didn’t necessarily get Guests to their destinations any faster than if they walked, but surely the chance to sit back and relax in one of the buses while enjoying the sights and sounds of the World Showcase ultimately seemed the better way to go.